Talking about money with your spouse or loved one is not an easy task. Things get more complicated when you both aren’t on the same page. Actually it can get super complicated. In fact, it can get so complicated that it causes unnecessary stress, arguments and misunderstandings with the family’s personal finances. So how do make this situation better? What kind of things can we do? Maybe you can avoid talking about it altogether? Ok, you know on this last question I am just kidding, right? You will most definitely have to talk about money but there is definitely a better way to approach the conversation aside from saying “we need to talk about our money.” I share with you my suggestions from personal experience and observations in working with clients to give you a fresh perspective. Never start the conversation about money, get to know each other's money stories instead. You need to succeed in shutting out the noise and be in tune to with what you truly want financially. UPDATED: Fresh Look Session not currently available. I’d love to hear from you! What would you add to this conversation? What has helped you make things easier with your spouse when it comes to the money area that you’d like to share? [00:00:27] JH: Hey there, this is Jen. Welcome and thanks for tuning in. I have to tell you, I am getting excited cause fall is right around the corner and if I can be honest with you, there are really only two seasons that I truly enjoy and that is Fall and Spring. And that is it. Because the extreme temps of hot and cold don't cut it for me, just really don't cut it for me. 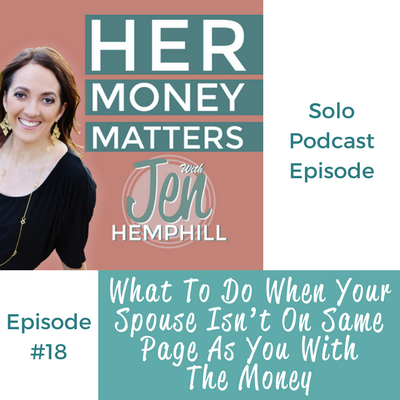 Today we are going to discuss about when you and your spouse are not on the same page in terms of your finances and what you can do about it. But before we do that, I wanted to extend a special invitation for you. We both know that the end of 2015 is quickly approaching and you know what happens once end of October rolls around, it just goes so quickly. So I want to make sure that you finish strong with your finances. So instead of starting 2016 with yet the same money revolution you've been promising yourself over, and over, and over again year after year, why don't we work together to improve what you're doing now and get you unstuck? That's why I want to offer you a complimentary, yes free, what is called a "Fresh Look Session". It's 60 minutes where we really take a fresh look at what you're currently doing and see what you need to be doing. Granted, in your heart you know what you need to be doing, but there's a reason why you're stuck and that's what we're going to find out. We're going to figure out why you're stuck to make the changes that you need to make, and figure out how we can get you unstuck. And so you can take those actions, make those changes, and move forward with the finances. Now this time-sensitive and limited, meaning this offer's only good to Monday, October 12th. And once the slots are filled, they are filled, that is it. So what is the catch in all this? If there are any catches they would be these: one, you will have to step out of your comfort zone so I can help you. Meaning you're going to have to be comfortable and tell me the good, the bad, and the ugly. And hopefully by now, and you having listened to me in this podcast, you feel comfortable with me and talking to me about, like I said, the good, the bad, and the ugly. The second thing if there's any catches is that it's going to be time out of your busy schedule. It's going to be 60 minutes out of your busy schedule, but I don't think that's too bad. And then depending on where the conversation take us, if I see it's a good fit, I may be sharing with you a special offer. So yes, that would mean the opportunity to continue working with me further. And that's it! So I'll share with you how to jump on this offer at the end of this episode, so that way we're not going to delay more on today's topic. So let's go ahead and move on. [00:03:34] JH: Talking money with you're spouse, on my goodness. That's a heavy topic, especially when money in itself can be such a taboo subject. But talking money with spouse, come on now, that's even — that's stressful, that's just not an easy task. And things get more complicated when you both aren't on the same page. So how do we make this situation better? What kind of things can we do? Can we really avoid talking about it all together? You know the answer to that is "no", right? The last question anyways. But there are definitely some things that you can do. But firstly I want to tell you the first thing that you don't want to do. Starting off, you don't want to start the conversation with money. Meaning, you don't want to be saying stuff like, "We don't have enough money." Or, "We need to be making more money." Or, "We are spending way too much money." Or even worse, "You spend all the money." Something like that, right? You don't want to start the conversation with that. Instead, the first thing that you really want to do is really get to know each other better. Yes, maybe you've been together for three years, five years, 15 years? Or even more. And yes, you may think you know your spouse well. But my question to you is, have you gotten to know about their upbringing around money? I'm not just talking about wether they came from a low-income background or a very wealthy background; that's not what I'm talking about. I'm really more talking about what they've experienced, what they heard, what they saw over and over again that has really had a significant impact on them and how they treat money and their relationship with money. Who knows? Maybe they haven't even noticed this consciously yet until you have that conversation. All of this upbringing, what you've experienced, what you've heard, what you saw over and over again is going to effect a relationship with money so we need to understand that about ourselves, our spouse, and each other. So basically we need to understand each other's money story, or what I like to say, money roots at times. You also want to discover each other's money truths. What do I mean by that? You want to be able to understand your own money wants and just to succeed shutting out the noise and being in tune with what you truly want financially. So what we're used to hearing over and over again from financial experts, the gurus and everything, they say some of the same advice over and over. Which makes sense; save more, spend less, and get out of debt, right? We say that. But what we tend to hear this over and over again that we forget to really tune into what our needs are, and our wants, and really understand what this looks like. So what does this look like for you? What is one thing that get's you fired up and excited about life? A fun way to do it is to play a game. So yes, you can have some fun with this. I found out about this game, it's called "The Prosperity Game", and I found out about this a few years back. It was created by a lady named Abraham Hicks. I don't know if you've heard of her, so I can put a link in the show notes you can read more about her and this game. And essentially I have my one-on-one clients do this, and basically the preface of the game — and I've tweaked this a little bit just to work with my clients — but the general purpose of the game is still there. So the preface of the game, you do this for 30 days. And you start out with one amount that you and your spouse or your partner decide upon. So on day one you could start out with $100. So this is pretend money, right? This is not money that you have to have in your account, this is pretend money. So you start out with, let's say, $100, and you both decide together what that money is going to be spent on. So maybe you split it 50/50 and they decide what they're going to spend the $50 on and you the other $50. So it all depends. So you have those conversations on how you want to spend it together. This is play money and it's a game, so it shouldn't be stressful. And then you're going to log how you spend it every day. Then the next day you're going to do the same thing, but you're going to increase the amount that you "spend". And again, you discuss it together as to how much you're going to increase it to, what you're going to spend it on, and you're going to log it. And day three, again, you increase the amount — you can increase it by $1, you can increase it by $50, $100, $1,000, however you want to do it. Now mind you, as you get through the days, you would think that having an infinite amount of money you would be able to spend it all. I'm going to tell you from experience, it's not that easy. So it really gets you thinking as to what you really want in life, what your true desires are, what gets you fired up, and really what I call your "money truth" is. Okay? So that is something that I would suggest that you can do and have some fun with. You also want to be able to respect each other's wants financially and see how can that be worked within your goals, within your budget cause remember you're individuals and you're naturally going to be different. And the point being here that you can't force someone to change, right? Let me give you an example; early on in our marriage there was this particular issue as far as financial issue and between us that we just struggled with. And that was, to make a long story short, my husband is a very giving person, he's got a big heart and he will go out on a limb to help you. So if it's also a financial need, he'll do it no questions asked. So what happens when you're married? You have expenses together, things to pay, things to buy, all that good stuff. It drove me crazy because it wasn't planned for, and I'm a planner as far — especially with finances, right? So that was a difficult situation, cause what do you do? Yes, he wants to help. And he's the type that if he's going to help, he's not going to ask for that money back. Right? Because he says if he has to give, he just gives it. So, like I said, it drove me crazy because it wasn't planned, and how did it fit in the budget? It was going to throw off what we were doing. So what we've done, years later, is that we've been able — we've decided to budget a certain amount of money every month, and if things arise that someone needs money or he wants to help a family member, or whatever the case may be, he can go to the account, see what's in there, and he can work from that. So that way it doesn't disrupt what we have going on with our financial goals, what we need to do month-to-month. And that's how we've solved that. So with the game you're going to learn — with the prosperity game — you're going to learn about some of their desires, some of their dreams, some thing that they've forgotten about that they liked, and about yourself too. So you just want to be able to respect those wants, those financial wants and see, you know, prioritize to figure it out to see how you can put it within the budget, see like, "Oh maybe we'll work on this next year depending on what exactly these wants are." And have that discussion. You also want to keep that money conversation going, and that is so critical. So you've had this conversation, everything's easier to talk about money because you've played the game, you've gotten to know each other on a financial "scale", if you want to call it that. And you've discussed financial goals, because at this point I didn't actually mention that, but you want to be able to discuss the financial goals because obviously that's important. And after that you just want to keep the money conversation going. So therefore you want to have frequent, what I call, "money huddles" to just check in and see how the plan of action that you've created for your financial goals, what's working? What's not? What you need to be changing, and proving, and so forth. So that is very essential cause you don't want to start, implement a plan of action for your finances and you don't check in what you're doing. But with this, at this point, it should be easier and you should be able to be more on the same page, cause you've already had all these conversations, you've gotten to know each other, and you've played the game, you've gotten to know more about yourselves as well. And that will be definitely helpful. So I hope this gives you a starting point to work from. I just help you educate you in your finances, obviously I am not a marriage counselor by any means! But I wanted to share with you what I have learned over the years in my experience, personal experience, also just in working as well. So hope you have found that helpful. Just let me know in the comments with your thoughts, and also be sure to share your tips. Maybe you have something that you want to share that have found beneficial and I didn't mention it. So by all means, share it. We'd love to hear it. So I've made you wait till the end of this episode to get the details on how to sign up for the Fresh Look Session, the complimentary session. What you would need to do is go to JenHemphill.com/freshlook. So that's "freshlook", and enter the code, "Finish Strong". And so again, you got to JenHemphill.com/freshlook and you enter the code "Finish Strong" to be able to book your complimentary session. I would go ahead and do it now before this offer is over. I believe in you, I'm looking forward to supporting you and chatting with you so I can help you and we can, together, finish the year 2015 strong — especially financially. And on another note, I don't want to forget to mention, if you happen to be listening to this and it's passed October 12th, make sure you sign up to be a part of my community. 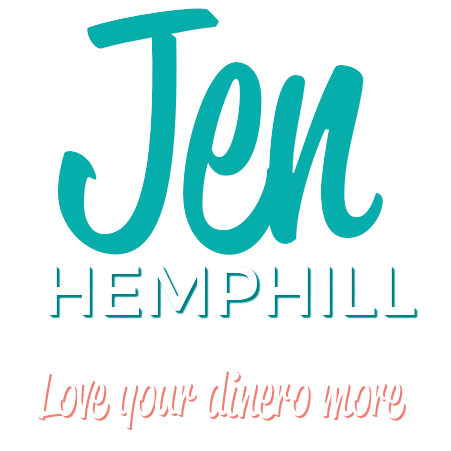 Which means you would sign up to get emails from me and you can do that on the website at JenHemphill.com. You can opt-in to get some freebies that I have, whether the cheat sheet or the mini-guide that is with all the podcast episodes. So that way you would get my emails and you will definitely get the announcements for the next promotions that I hold similar. I always try to do something different. So definitely, if you're hearing this after this, make sure just to get on the list if you're not already. And if you are on the list, just make sure you keep an eye on those emails. So that is a wrap for today. Thank you for taking time out of your busy schedule to tune into this show. Be sure, if you want, to check out the show notes so that way you can just see briefly what we talked about, and you can refer to the links that I mentioned. So you can go to JenHemphill.com/18 as in episode 18. That's JenHemphill.com/18. Thank you so much for listening, and we will talk again next Thursday. Chao! [00:17:03] JH: Thank you so much for tuning in to this podcast all about making your money management simple and practical. For being a VIP listener I have a special free gift for you. It arises from a question I get most often, which comes down to feeling lost and having no idea where to start. 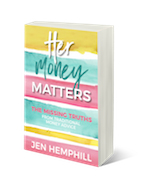 That's why I created this Jump Start Your Money mini-guide to help busy women like you finally start with a clean slate and take the action you need with your budget without the overwhelm. You can find it at end of each episode at JenHemphill.com/podcast.